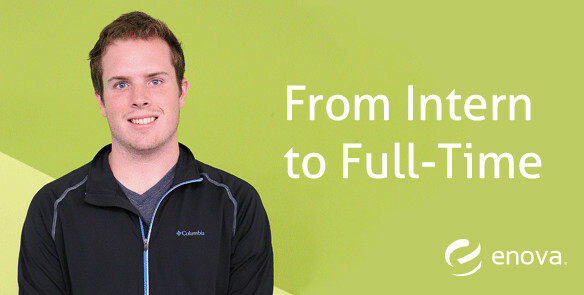 From Intern to Full-Time - Enova International, Inc. I recently had the opportunity to return to Purdue and speak with students about my experience interning at Enova. This was the first time I had set foot in a classroom since graduation, and I enjoyed being able to share some of the lessons I have learned as I moved to the other side of the table. The story I told started in the summer of 2014 when I had the opportunity to work at Enova as an intern developer. Even though I’d worked at tech companies in the past, Enova was different. This was my first internship outside of my hometown in Iowa, and Chicago is orders of magnitude larger than any city I had lived in before. I was excited coming in, but also pretty nervous. Fortunately, Enova helped me feel right at home. It was the first place that really challenged me. During my previous internships, when I finished a project, I’d have to wait to get more work. The culture didn’t allow me to go out and find work, and many times I was told there wasn’t any for me. Enova, on the other hand, always had work for me. Instead of spending days building Android games and reading Game of Thrones, I was finally able to spend all day writing software! I was able to seek out project managers and ask for work to be sent my way. I was encouraged to do more than just the summer intern projects. That culture and opportunity to push myself is really what stood out, and helped me to know this company and this city was the right fit. At this point I’ve been at Enova just about four months, and it’s been great. I have already had the opportunity to learn more technologies than I ever expected to right out of school. I’ve brushed up on Java, learned Swift, and released a Go app. After my initial hesitations about living in the city, I know I made the right decision.